Zinc analysis allows, in a simple and fast way, to quantify the concentration of the analyte in the water used in the brewing process. 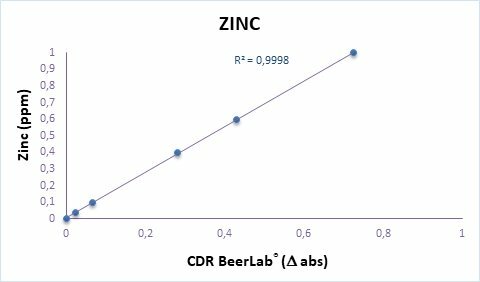 Zinc levels in the water used in the brewing process can be measured using CDR BeerLab®, a system which enables you to carry out a wide panel of chemical analyses on beer and water, using a single instrument, in a process that is faster and simpler than traditional methods. Time testing: one test 1 minutes. The calibration curve was constructed using standard chloride solutions. The trend of the curve confirmed an excellent linearity of the system over the whole measuring range. Zinc reacts in an alkaline environment with a chromogen to form a colored complex, whose absorbance measured at 580 nm is proportional to the amount of analyte present in the water sample. Zinc in Water was last modified: February 22nd, 2019 by CDR s.r.l.